I absolutely love this picture. The colours are perfect everywhere and I always appreciate it when at the top it is black sky with stars and the colourful stuff beneath it. Good idea with the tongue. I already used it as desktop background. 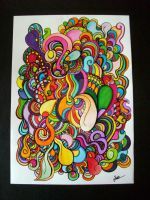 It is great looking at psychedelic art while listening to psychedelic music (rock & electronic). A real Divine Moment of Truth experience , wonderful . She looks so happy. Nice trippy art! Hi can you tell me what the message of your painting is? It seems kind of menacing but whimsical, is that right? Hey is it cool to use one of these as my background on Facebook?? These are exactly what I'm looking for there're unbelievably EPIC!! A steady hand at the wheel indeed! Thanks for bringing this back for our enjoyment. Love this colorful artwork. The details on this is totally fantastic!! I hope to see your work soon ! can i promote you?i do similar work,It's amazing that you use hallucinogens to produce art ,enhance your skills,and to spark your artistic imagination,to generate idea's.It's hard to find artists that use this method,now a day's.I appreciate what your do here.please comment back and let me know how you feel,about being promoted. Vous devez savoir que je suis une " sans culture " je regarde et je dis ce que je pense ....j'aime, alors je pose un +, je n'aime pas....je ne dis rien . Comment ça ?? :-/ Je suis à des lieues de penser que vous êtes inculte... Qu'est-ce qu'y vous fait dire ça ? Amazing! I love it. You're fantastically talented. Oh! But do you like it ? wow! just loved it! Very fun and inspiring.